The fear of pain in the course of dental treatment has caused millions of people to avoid regular visits. This anxiety results in unnecessary dental neglect, worsening of dental conditions, and future pain and expense. While it is unfortunate, it is preventable, and we can help! It’s important to know that a visit to the dentist can be a positive experience, even when treatment is necessary. Modern dentistry now offers safe, effective, and comfortable treatments to anxious and fearful patients. 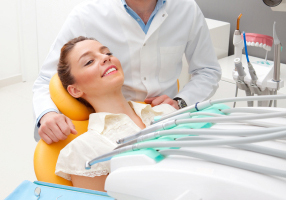 Sedation dentistry is used to provide a relaxing and anxiety-free experience when receiving dental treatment. It enables individuals too afraid to go to the dentist to receive the dental care they need while avoiding the common apprehension known as dental phobia. We can make your dental visit a positive experience and help you improve the health of your teeth and give you the confidence you need to smile again! Unlike General Anesthesia, where a patient is completely unconscious, patients under Conscious Sedation are able to respond to commands and breath on their own. 1. Enteral Conscious Sedation “Orally Administered Sedation”, sometimes called ”Sedation Dentistry” is administered by taking a pill. All body functions remain normal and the person is able to breathe on their own. The patient will often fall asleep. Some degree of amnesia is common. The disadvantage with this method of sedation, is that the level of sedation for each person is not predictable. 2. Inhalation Conscious Sedation, Nitrous Oxide/Oxygen Sedation also known as “laughing gas”. This is the most frequently used sedation method used in dentistry. All bodily functions remain normal and the person is able to breathe on their own. The patient will often fall asleep and experience some degree of amnesia about what happened during their dental appointment. Inhalation Sedation has been used my dentists for many years. 3. IV Sedation also known as Deep Conscious Sedation is usually used by Oral Surgeons and dentists with specialized training and special certification. With this type of sedation, medications are administered directly into the blood stream. The greatest advantage of IV Sedation is that if someone is not sedated enough, the doctor can administer more medication and the effects are instantaneous. IV Sedation is not used commonly in most dental offices because of the specialized advanced training required and the requirements for certification by the State Board of Dentistry. The drugs used for IV Sedation are more effective then the same drugs taken orally. There is a more profound amnesia associated with this technique.